Last Friday , I asked you to find how Beni (playing White) forced a quick win in his game against Schwarzbach from Vienna 1969. There are actually 2 winning moves (but both have the same idea): either 1 Qh3!! (as played in the game) or 1 Qh5!! 1 Qh5!! 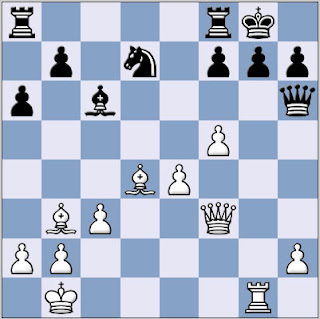 Qxh5 2 Rxg7+ Kh8; 3 Rxf7+ Kg8; 4 Rg7+ Kh8; 5 Rg8 mate. A number of you emailed in correct solutions: special mention to Chris Wardle, Andrew, Paul Dargan and Paul Runnacles. Apologies for the slow posting of the solution, and the lack of material today on the blog: we had a powercut late yesterday evening that knocked my wireless router out of sync. Fortunately, everything is now back up and running. The reason I found the move was because it *does* threaten to win material; Qxh6 is a pretty strong threat. Having gotten nowhere with the checks and captures I moved onto the threats, and the only Black piece that isn't nailed down is the Queen. I looked at Be3, then Rg6, then Qh5. I still maintain that 95% of problems can be solved by a methodical search for forcing moves! Yes, I was stretching it a little on the no threat! Although on the face of it, it's a queen for a queen. Ok, the recapturing pawn is pinned, but nonetheless is less obvious a threat than a knight hitting a queen or such like. It's great to have your thinking processes on this one, and to know that you had to cycle through a few ideas. One additional step (I think) I carry out before the checks / captures is to look for any mating patterns (and to envisage how I could effect them).